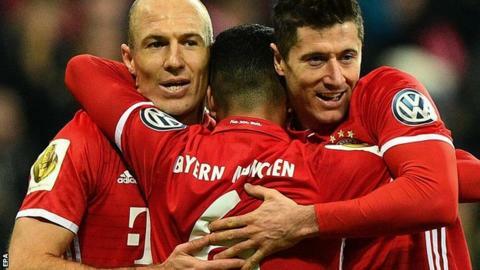 Robert Lewandowski scored his 30th goal of the season as Bayern Munich beat Schalke to move into the German Cup semi-finals. Lewandowski gave the home side an early lead as he chipped Franck Ribery’s pass into the net after three minutes. Thiago Alcantara then headed in Lewandowski’s cross before the Polish striker tapped in Bayern’s third. Holger Badstuber was sent off for the visitors as he picked up his second yellow after a foul on Javi Martinez.